1. Combine vegetables, cover with 2 inches of cubed or crushed ice, and refrigerate 3 to 4 hours. 2. Sterilize canning jars and prepare two-piece canning lids according to manufacturer’s directions. 3. In 8-quart kettle, combine vinegar and mustard and mix well. Add salt, sugar, celery seed, mustard seed, cloves, turmeric. Bring to a boil. 4. Drain vegetables and add to hot pickling solution. Cover and slowly bring to a boil. 5. Drain vegetables but save pickling solution. 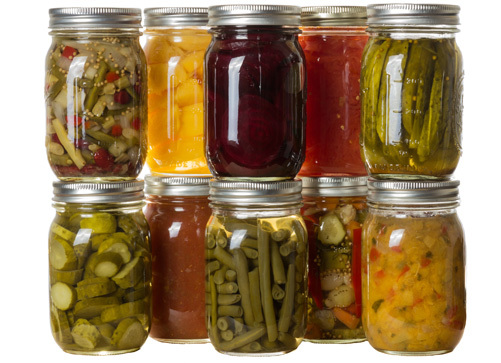 Fill vegetables in sterile pint or quart jars, leaving 1/2-inch headspace. 6. Add pickling solution, leaving 1/2-inch headspace.